Oooo it’s another healthy meal! And you’re totally skipping it. But listen. Before you do. There’s pesto involved. Lemon peel pesto. 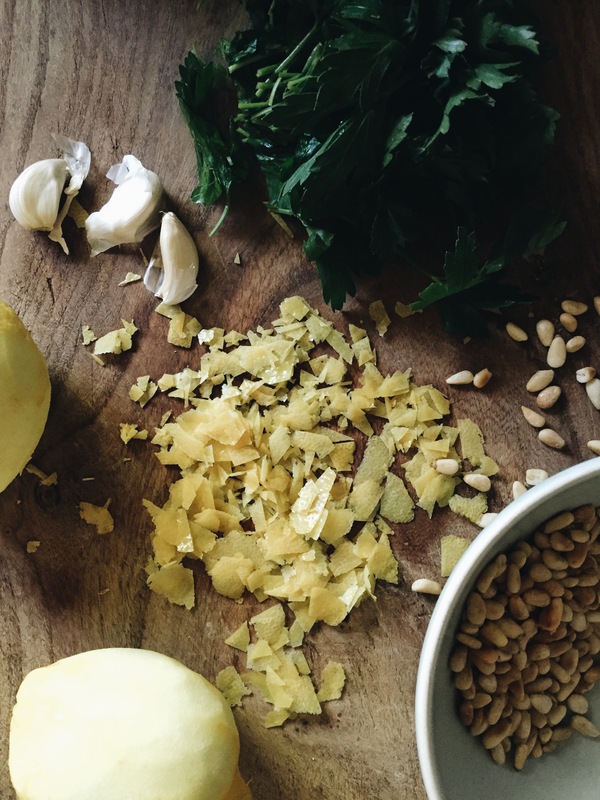 Lemon peel and lemon juice and parsley and pine nuts and garlic and parmesan. Oh my? This meal is actually another attempt to cut back/down on my food/calorie intake before my trip to Cabo Wabo (<–just kidding. I think.) later this month. It’s definitely lighter, even with the roasted potatoes. You know what, I don’t even count roasted potatoes as carbs, because they’re cute little roasted nubbies of potato delight. I promise never to say roasted nubbies ever again. It’s the pesto though that brings it all together. Super lemony, super summery, super bright, super acidic and punchy. It’s perfect brushed over the broiled fish. And you can accidentally swirl it into your roasted potatoes and asparagus and that will not make you a bad person. I wanted to use all caps on the word perfect up there, but I’m trying to better about SCREAMING at you. I mean screaming at you. I also put a tiny pinch of crushed red pepper in the pesto, because lemon + crushed red pepper = ALWAYSANDFOREVERAMEN. So the deal with the roasted happiness: Potatoes go in for 30 minutes at 400. Then you’ll add the asparagus spears and go another 30. Olive oil, fresh rosemary, salt and pepper. Das all. Das eet. 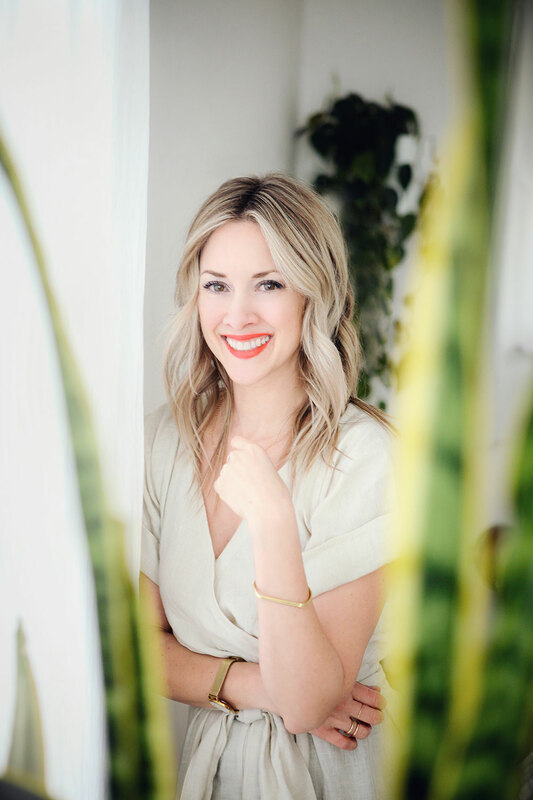 I KNOW you can get on board with this. And for the fish, broil it! Once you’re done roasting the veggies, flip that ish to broil and slide the fish in for like, six minutes. If that. 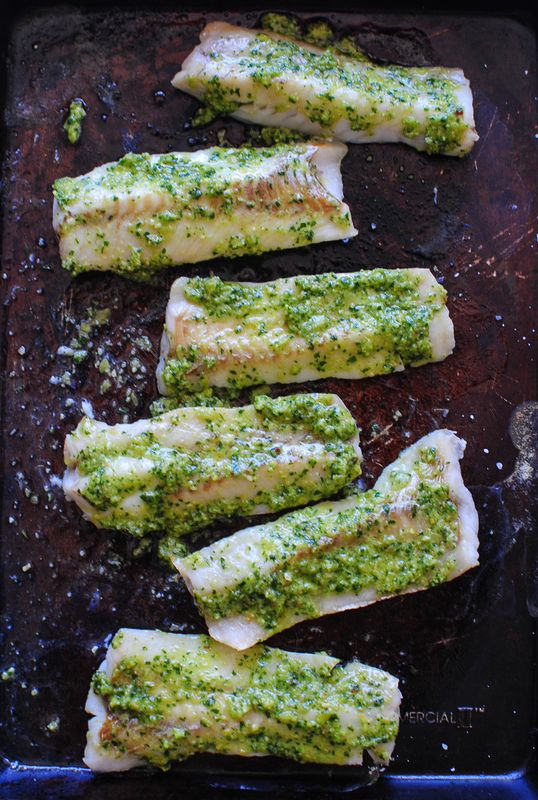 Pollock fillets are tiny, so they’ll start to curl up just slightly on the ends, to let you know they’re done. Just don’t think about Dory or Nemo or baby Dory during any of this part, ‘mkay? After you broil, you’ll brush the pesto over the fish and call it a day. Serve it over the roasted bliss, and then try not to eat all the potatoes at once like I probably most certainly did. I told you I still needed work. Make this occur for your face. 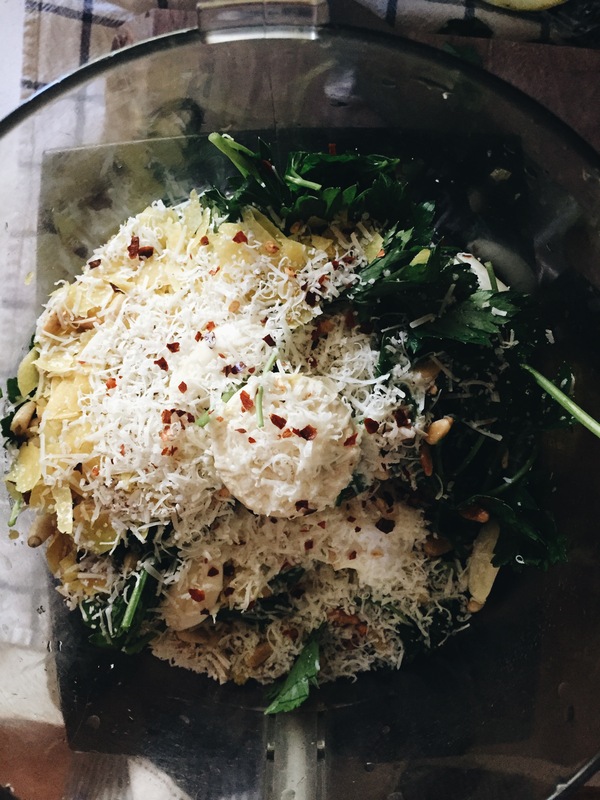 To make the pesto, combine the lemon peel, juice, parsley leaves, pine nuts, parmesan cheese, garlic, and crushed red pepper in a food processor. Season with a pinch of salt. With the motor running, slowly add 1/4 cup of the olive oil in a thin stream, until it becomes a pesto consistency. If you need to add a tiny bit more oil, das fine! 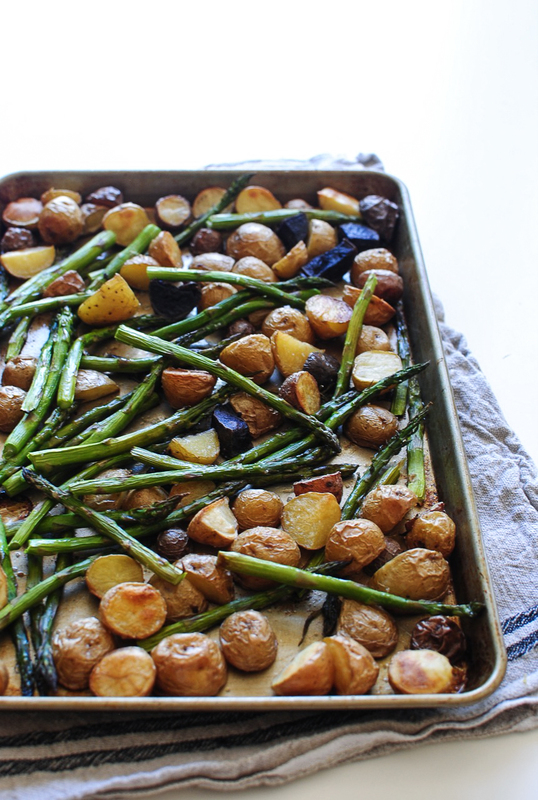 Arrange the potatoes on a baking sheet. Drizzle the remaining 2 Tbs. of oil over the potatoes, and sprinkle with the rosemary leaves, and a pinch of salt and pepper. Toss everything your fingers, and slide it into the oven for 30 minutes. After 30, arrange and nestle the trimmed asparagus spears on the pan with the potatoes, and back in she goes for another 30. Set the veggies to the side to rest, and flip the oven to broil. 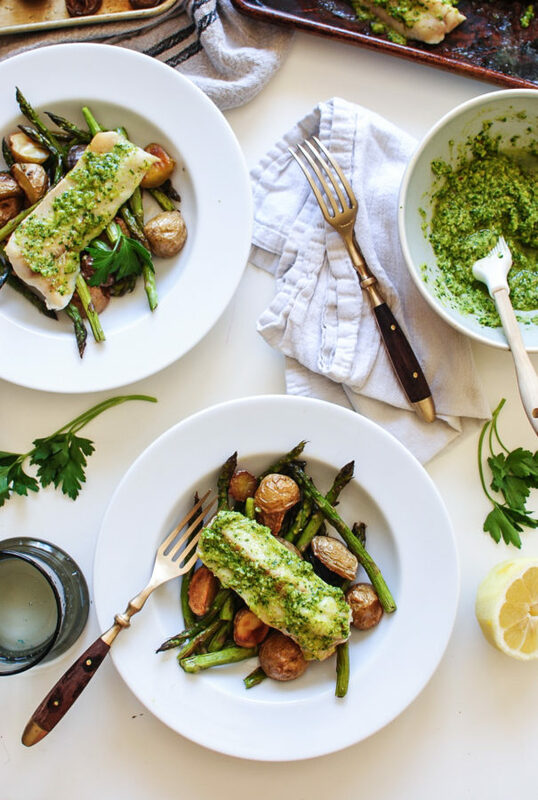 Arrange the pollock fillets on a baking sheet, and broil for six minutes, until flakey and cooked through. 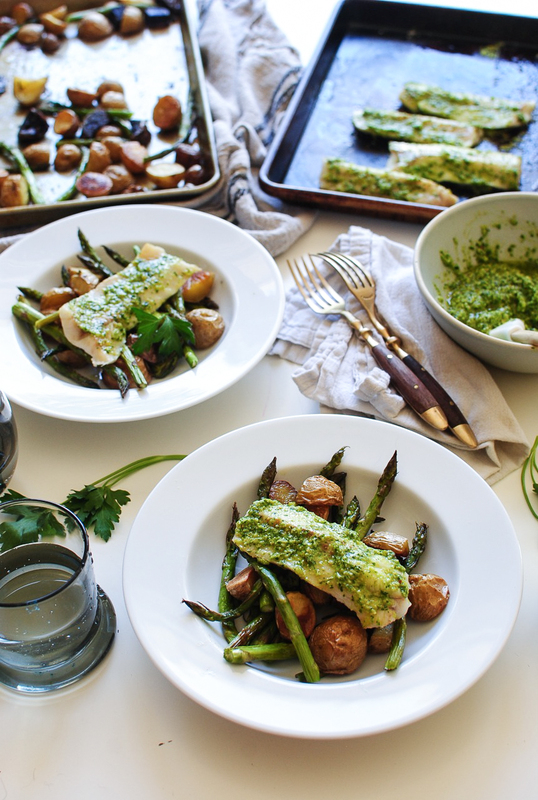 Brush the pesto over the fish, and place on top of a mound of roasted potatoes and asparagus. SERVEEEEE. So healthy! Did you skip it? 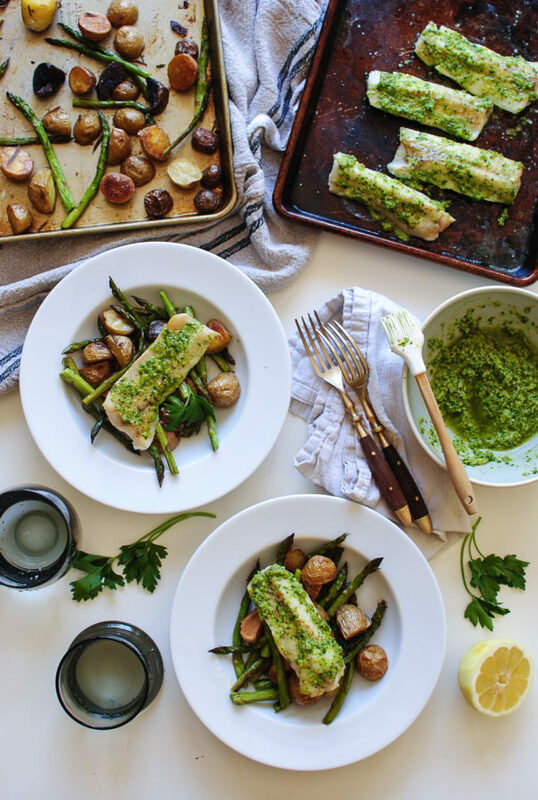 Asparagus is done here, or at least very spendy ... and I tend to cook salmon - OFTEN - but that pesto - THAT I will do exactly as written. And since I have fresh sage, I might try some sage in the pesto for an experiment. Here in Northwest Montana, it is sweet cherry season and sweet cherries are a great side or on top of something like this. Saw this first thing this morning and thought to myself, "Yup, this is what I am making for dinner!" Thanks Bev! Can I do this with tilapia!??? Yuuuuum!